Few things make great fundraising more than custom t-shirts. Raising money with custom t-shirts is very cost effective and easy to do and who doesn’t love a new t-shirt? 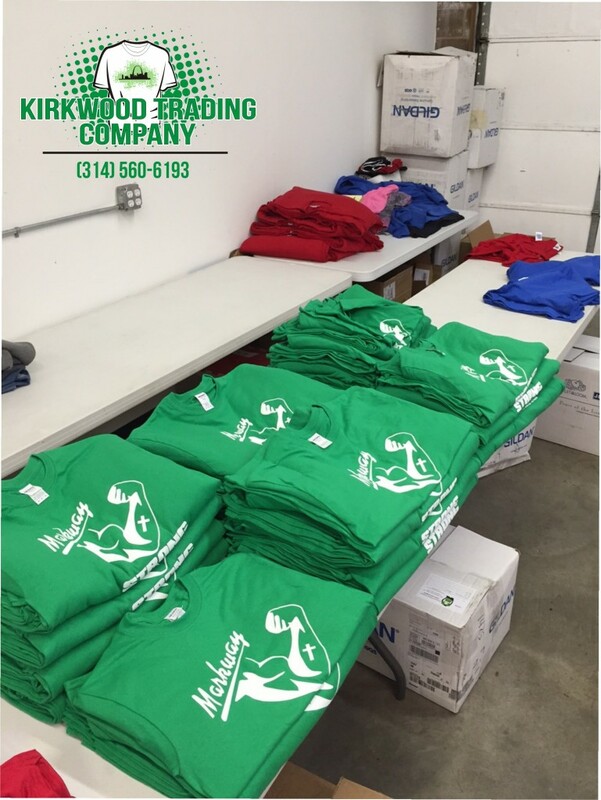 Kirkwood Trading Company screen prints custom t shirts for all kinds of clients from team sports, businesses, churches, schools, foundations, and fundraising. While they all are fun and unique in their own way, printing shirts for fundraising cause is really something special. It’s a bittersweet process because we hear the stories behind the shirt order and why specifically these shirts are being printed. When a soccer team needs shirts it is pretty much understood the purpose behind that. When a customer walks in our door with a picture of a young teenage girl and asks if it’s something we can print on 50 t-shirts, we understand the exact purpose of why something wants a photograph of someone on a shirt. Usually it’s pretty grim and in most cases when someone wants a picture of a family member on a t-shirt, it’s because they have passed away from a range of things from heroin, car crashes, cancer, etc. It’s bitter because nobody wants to start their day off printing a picture of a deceased person on a bunch of t-shirts. Thank goodness in this line of work there happens to be the sweet part, and that’s the happiness on the clients faces when they see the finished product, and they take that finished product to raise awareness, sell to raise money for a funeral or a charity, what have you. Not too long ago 2 mothers can in our shop to look at raising money with custom t-shirts. It was not a fun day to say the least because they each had a picture of their 18 year old sons who died together from heroin overdoses. There sons were best friends and ultimately and tragically died together at a young age. They wanted to sell shirts to raise awareness on the heroin epidemic in St. Louis as well as raise funds for funeral costs. They had support and new they needed 50 t-shirts to help offset some costs. We put together a design using the young men’s photos, the order was placed and 2 days later we started printing first thing in the morning. Most people working at Kirkwood Trading Company have children of their own so a custom t-shirt order like this hits home a little bit. It was a somber morning because looking at these pictures these two handsome gentleman, now deceased, looked like they have the potential to do anything they wanted as they grew up. The next morning the moms come in to pick up the order. Yesterday was sad, the next day when they picked up the shirts was happy. They were crying they were so happy to have these shirts and new what these custom tees meant in the way of awareness, offsetting funeral costs, and just for their own keepsake. Through these custom t-shirts their sons would live on and their message would ring clear. As it turned out, the shirts were such a hit with their community that they came back the next week and ordered 100 more shirts. Their message was heard and it brought closure to an otherwise tragic event. We have so may stories like this. Most recently printing shirts for a young man I feel privileged to have met who went through a living hell with cancer. He went into remission for a bit and actually was hired by us to do some social media work. I spoke with this young man one day for 30 minutes and it’s the only time I ever spoke with him as he worked directly with another individual. But in that 30 minute chat I see why he had such an impact on everyone he met and why he had hundreds of friends to where the family ordered a few thousand t-shirts in his honor for raising money with custom t-shirts. I don’t know the exact number but when you order a couple thousand shirts the cost is low, the profit they made was donated to the lymphoma society and I’m guessing based on what sold the shirts to them for and what they resold them for in their fundraising effort probably raised around $6,000-$10,000. That’s is a huge impact one individual had on his peers. And it was heart warming effort on our part because we helped them in their efforts. Custom t-shirts are marketing whether you are a business, a sports team, a church, or a bunch of guys celebrating a bachelor party. Those shirts are your brand and few things are more powerful that cost so little. If you are looking at raising money with custom t-shirts contact us here at Kirkwood Trading Company. We will work with you to make sure your shirts are the something to be proud of. We can print or sew your logo on any number of different garments and no matter your cause, we will be happy to get your there.